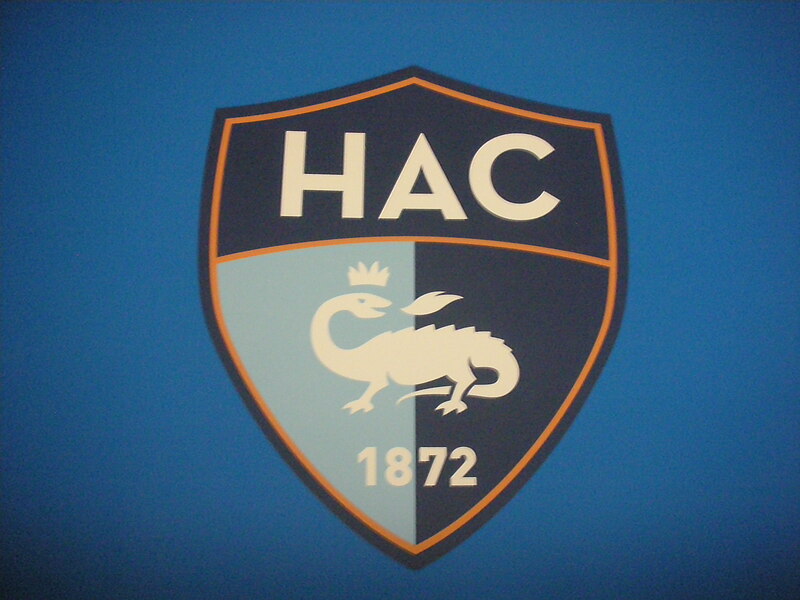 Havre Atheltic Club are France’s oldest recorded football club, tracing their roots back to English residents in the port town forming an athletic and rugby club in 1872. A quixotic melange of football and rugby rules were employed before association rules were fully adopted in 1894, a year after Mulhouse albeit that side were in Germany in those days. 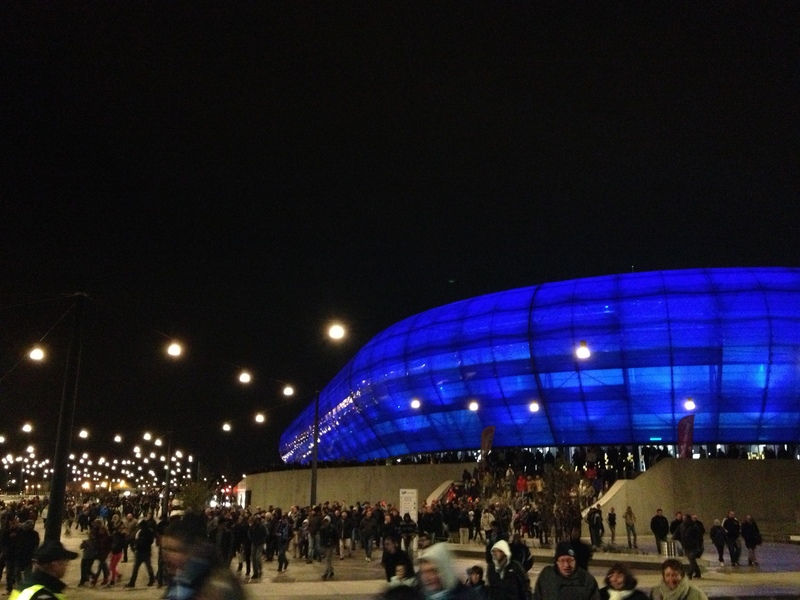 So when an old but only moderately successful club suddenly built a new all singing, all dancing 25,000 seater stadium for 80 million euros it would be rude not to check it out. 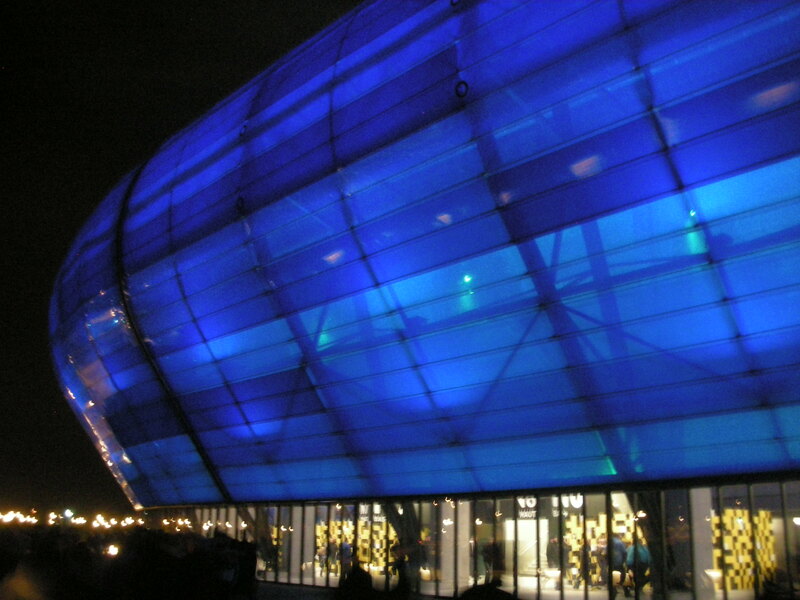 We arrive in Le Havre conscious that the new arena is opposite the old stomping ground of HAC, the Stade Jules Deschaseaux. It’s still an impressive sight itself, all pre-cast concrete and wavy roofs cleverly set into a steep hill. It is also fortressed like a maximum security prison. Pleas to gain admittance into the crumbling relic fall on deaf ears and we have to content ourselves to the match ahead. 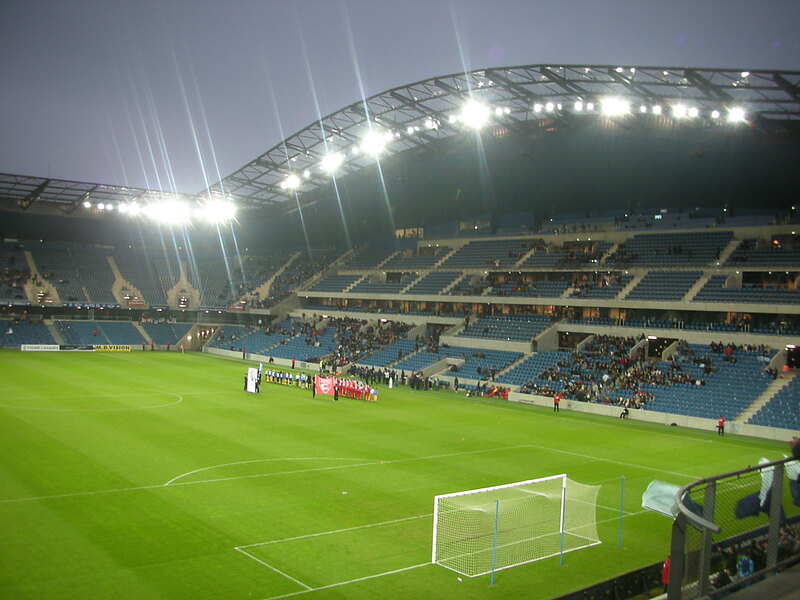 The Le Havre commune have a decreed a condition that the club must follow “commune week” once a year and charge the populace a minimal fee for entry for one game. Luckily for us it means we gain admittance to this stunning edifice for the princely investment of three euros. A wafer thin but gratis programme is secured and then we find our seats. To be fair the stunningly cheap ticket offer has not meant a full house, far from it. 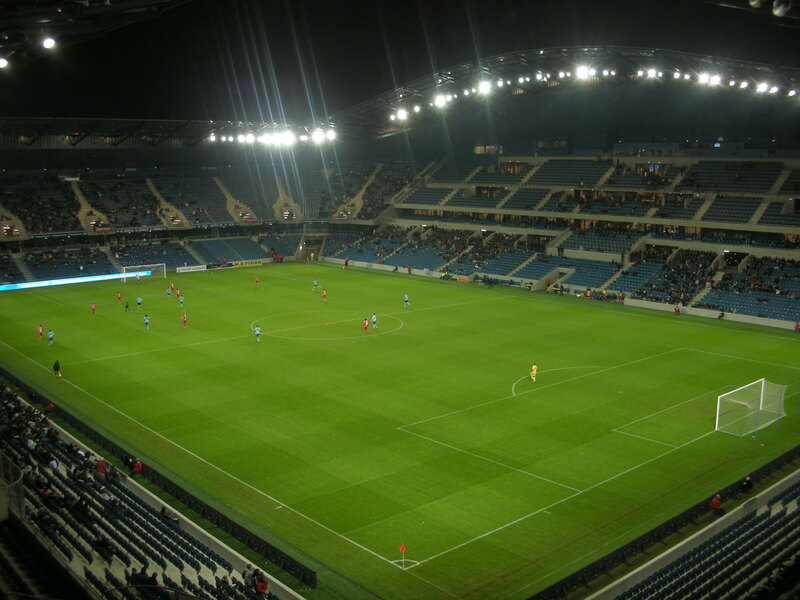 We estimate between 3,000 and 4,000 occupy an ocean of empty blue seats. 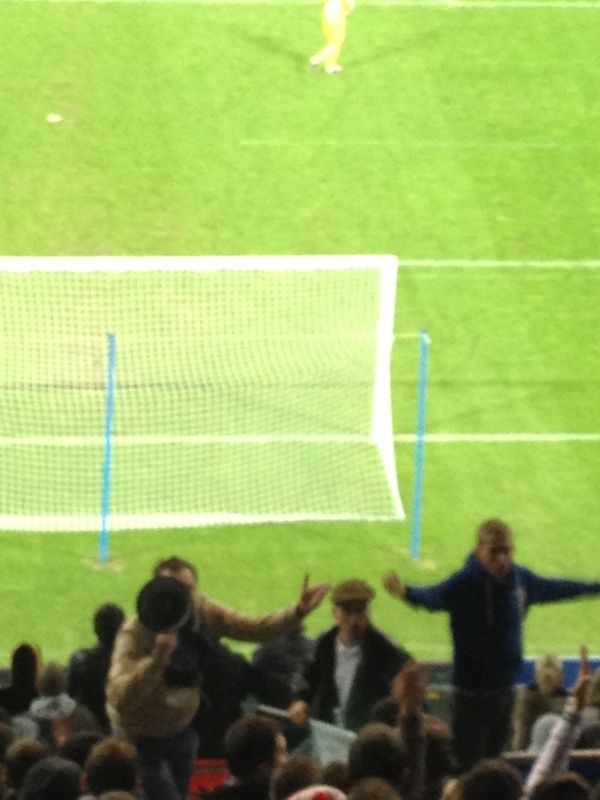 It comes as as a shock to us all that after the game websites declare 9,112 are in attendance. Internally the ground is aesthetically pleasing, the single wave on the main stand confirming its superiority over the uniform stands around the rest of the stadium. 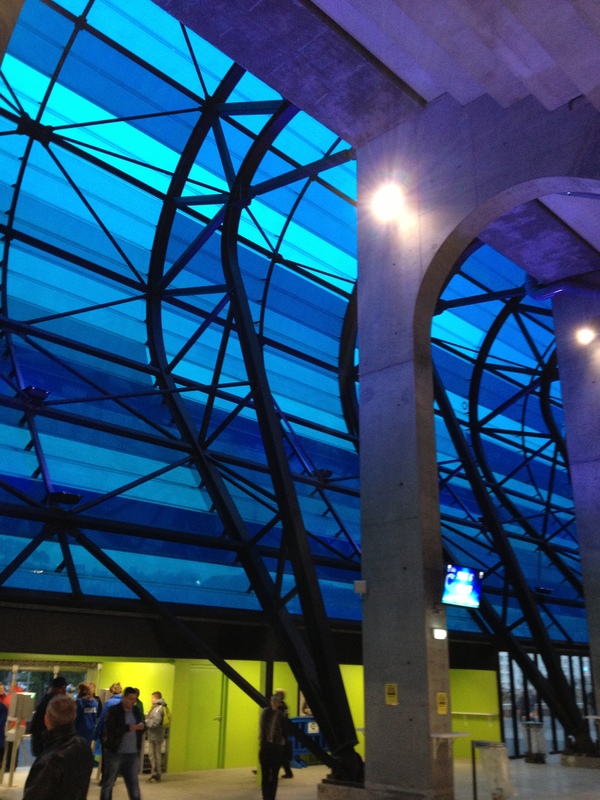 In the concourses prior to kick off the blue casing we long to see illuminated remains dim but casts an interesting hue around the internal skeleton of the stadium. The concourses are further enhanced with brightly coloured tiled walls. The game itself between two mid table sides flashes by, Yohann Riviere gives the home side the lead before halftime with a crisp shot, only for Vincent Gragnic to restore parity moments after the restart. Though both sides have ample opportunities to create a winning goal, profligate finishing, however, sees the spoils shared. The home players are unjustly booed off the pitch at the final whistle. On departure the full majesty of the Stade Oceane becomes clear. 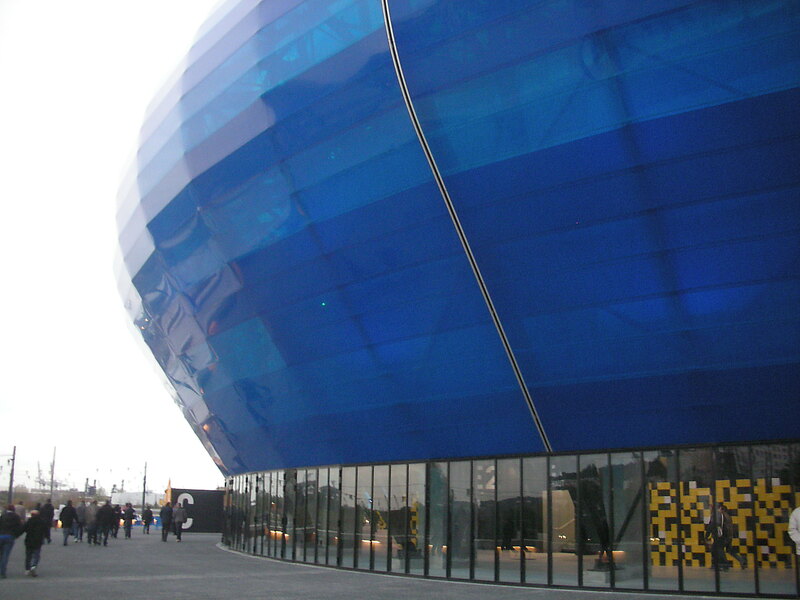 The encircling blue exterior is alight with electricity and emits an ethereal electric blue glow, like a remake of Close Encounters of the Third Kind has chosen the harbour front at Le Havre as a film set. Full marks for the audaciousness of this new build and its undoubted beauty but one wonders what they will have to do to fill the stadium on a regular basis. 1. Zacharre Boucher; 19. Benjamin Genton(c); 13. Cyriaque Louvion; 3. Benjamin Mendy; 10. 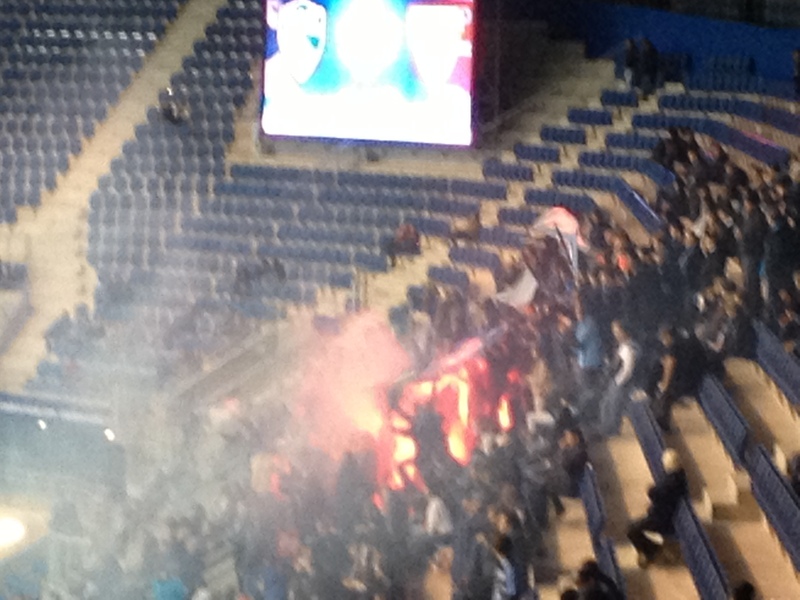 Walid Mesloub; 5. Zargo Toure; 8. Distel Zola; 17. Alexandre Bonnet; 11. Yohann Riviere; 20. Geoffrey Malfleury; 22. Riyad Mahrez. Subs: 9. Riad Zouri (for 22, 62 mins); 6. Julien Francois (for 10, 70 mins); 14. Bengali Koita (for 20, 70 mins); 16. Johnny Placide; 21. Maxime Le Marchand. 16. Cyrille Merville; 33. Salaheddine Sbai; 22. Aurelien Bauche; 18. Benoit Poulain (c); 29. Vincent Gragnac; 11. Mouritala Ogunbiyi; 13. Komlan Amewou; 27. Pierre Bouby; 19. Moussa Sidibe; 12. Seydou Kone; 10. Nicolas Benezet. Subs: 7. Matthieu Robail (for 11, 85 mins); 9. Romain Thibault (12, 90 mins); 1. Haidar Al-Shaibani; 4. Sebastien Piocelle; 21. Yassine Haddou. 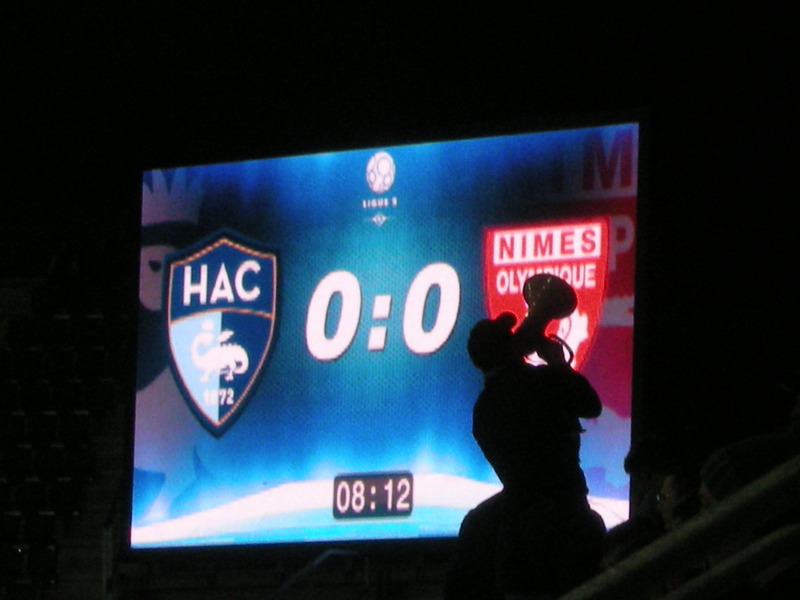 This entry was posted in Travel, Matches & Stadiums and tagged france, frenchfootball, havre, havreac, ligue2, nimes, oceane, stadeoceane by peterrmiles. Bookmark the permalink.